Remember earlier MAC Security Blog reported that the latest version, Flashback.D, has gotten a bit sneakier. First, it checks to see if the user is running Mac OS X in VMware Fusion. If so, it does not execute. It does this because many malware researchers test malware in virtual machines, rather than infect full installations, as it is easier to delete them and start over with clean copies. 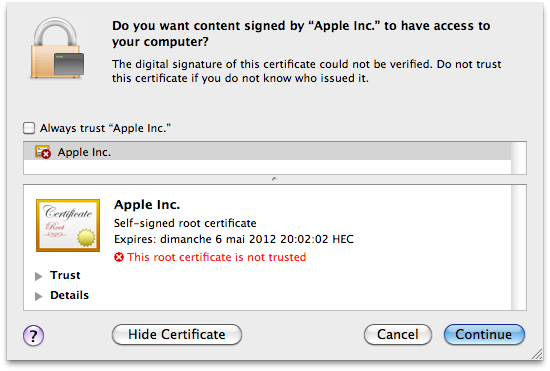 This means that security researchers analyzing and looking for this malware need to be running regular Macs. Yet again Mac users became the victim of another trojan. This new Trojan virus is capable of infecting their computers and stealing passwords to services such as Google, PayPal, online banking & so on. This virus is using a new installation method When a user visits a crafted web page, the new variant either tries to exploit two old security vulnerabilities or deploys a Java Applet which tries to trick the user into believing it has been certified by Apple. According to Mac Security Blog (Intego):- This new variant of the Flashback Trojan horse uses three methods to infect Macs. The malware first tries to install itself using one of two Java vulnerabilities. If this is successful, users will be infected with no intervention. If these vulnerabilities are not available – if the Macs have Java up to date – then it attempts a third method of installation, trying to fool users through a social engineering trick. 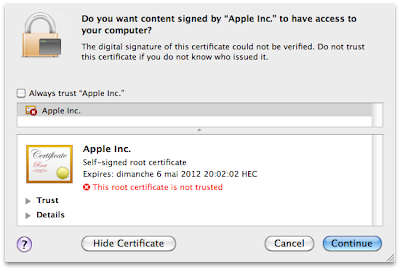 The applet displays a self-signed certificate, claiming to be issued by Apple. Most users won’t understand what this means, and click on Continue to allow the installation to continue. It is worth noting that Flashback.G will not install if VirusBarrier X6 is present, or if a number of other security programs are installed on the Mac in question. It does this to avoid detection. It seems that the malware writers feel it is best to avoid Macs where the malware might be detected, and focus on the many that aren’t protected. Earlier also Mac users faced such attacks where OSX/Revir-B trojan was installed behind a PDF, and giving hackers remote access to MAC computers, not only Revier-B also Linux Tsunami trojan Called "Kaiten" targeted Mac OS users in 2011. Also another malware named "Devil Robber" which was also make MAC users victim while stealing their personal informations.